In my early pregnancy when I was keeled over dying of nausea and forgot what my makeup even looked like, I spent a lot of time stalking everyone on social media. This means I was bombarded with seeing ads from Thrive Causemetics. If you’ve seen these ads, they’re quite enticing and after seeing maybe, 50,000, I decided to place an order of my own and test out a few products for ‘blogging purposes’ (it’s always for blogging purposes… at least that’s what I tell my husband when he sees my Sephora and Ulta transactions…). 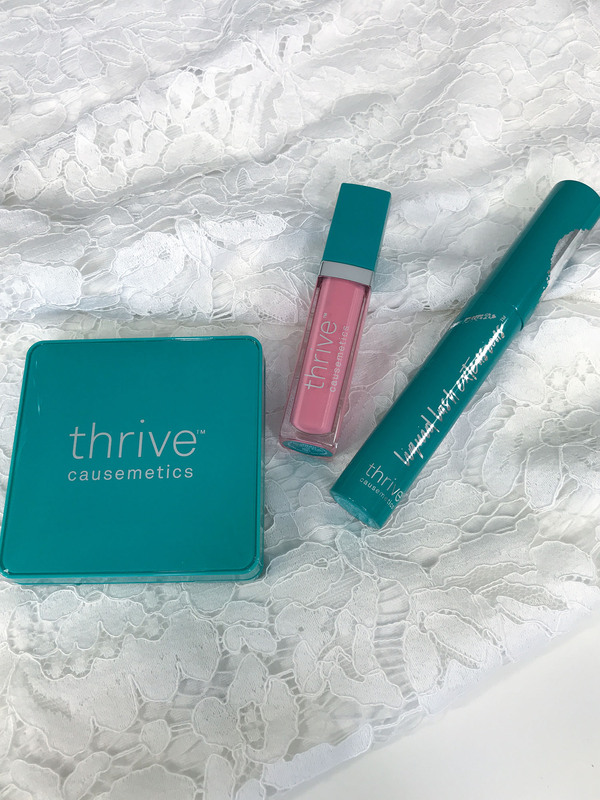 Now that I’m feeling way better, I’ve been testing the products out and I’m ready to share my Thrive Causemetics review and makeup look. Thrive Causemetics was started after the founder – who is a makeup artist – best friend was diagnosed with cancer and unfortunately passed away at the young age of 24. Founder Karissa Bodnar started Thrive Causemetics to be clean, vegan and 100% cruelty-free to help empower and inspire women to feel their best – from and beyond cancer treatment. A portion of sales from Thrive go to their Beauty With A Purpose program to give back to women in need and deliver products and services at hospitals/events around the world. 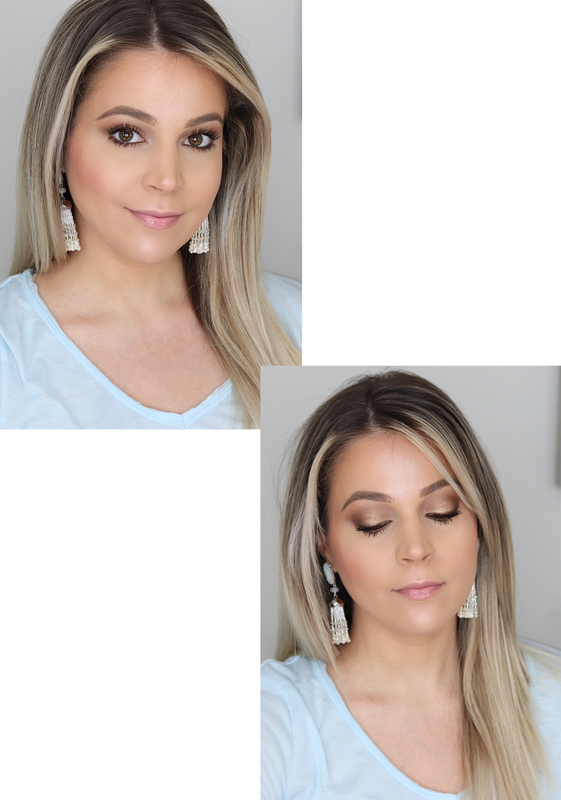 The full collection includes everything you need for quick makeup to full glam (with the exception of a base/foundation product at the time of this blog post). Thrive currently has bronzers, highlighters, blushes, eyeshadow palettes, eyeliner, mascara, liquid lipsticks, traditional lipsticks, lip pencils, lip glosses, and tools. They’re only sold online right now on thrivecausemetics.com. I decided to order an eyeshadow quad (in No. 1), their popular mascara, and a lip gloss (in Jean). 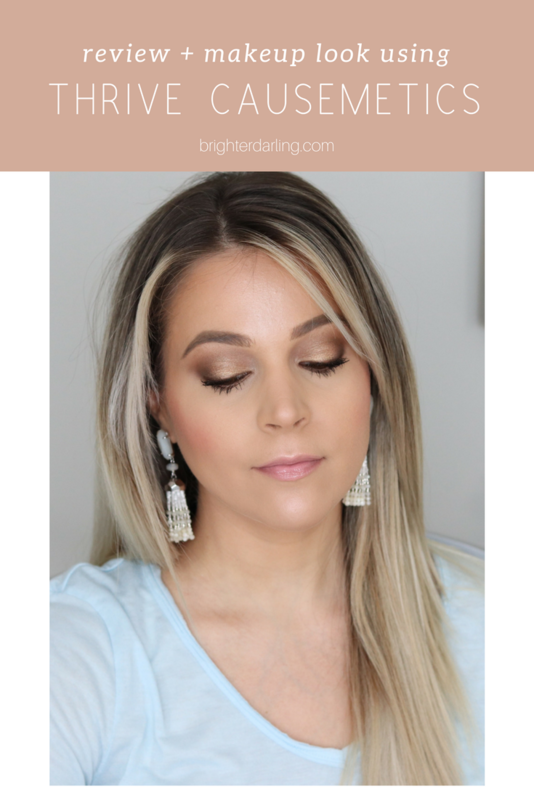 Thrive’s eyeshadow directions make it easy to follow along and create a professional look even if you’re a makeup newbie. They say to apply the lightest shade all over the lid as a primer, focus 2nd lightest shade on the lid, pull 3rd lightest shade through the crease and use the darkest shade to line/define/smoke. All of the eyeshadow can be used wet or dry to intensify the look and are made with semi-permanent pigments for long-wear. The Liquid Lash Extensions mascara is a volumizing and lengthening formula in (what I consider to be) a tubing formula. This means it does NOT come off until you remove with cleanser + water and it will slide off in chunks. This mascara is not technically waterproof, but I will tell you it is not going to smudge, flake or budge on you ALL DAY LONG. 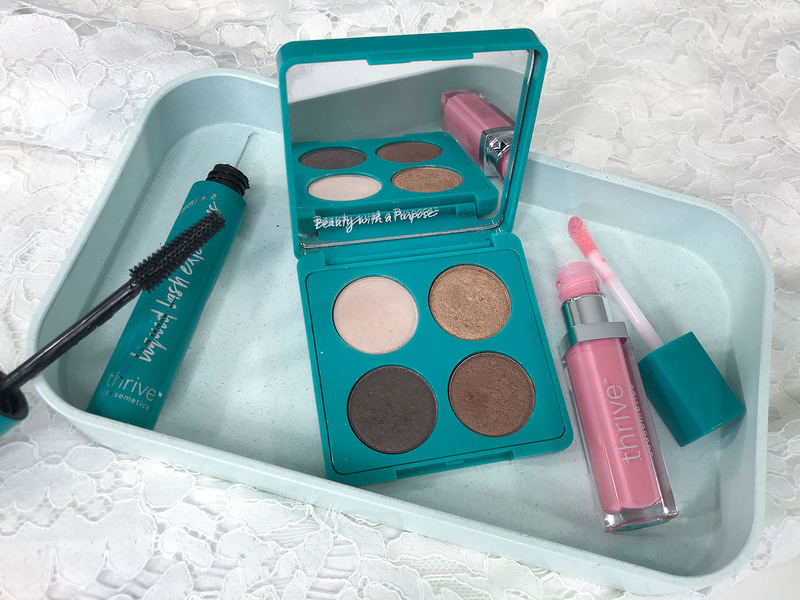 It’s designed to give a faux lash look – without the faux lashes! The Glossy Lip Mark reminds me more of a creamy balm. It’s not at all sticky, extremely hydrating on the lips and it said to leave behind a slight stain even when worn off. It’s hard for me to know if that stain property is true since I picked a very light pink color. 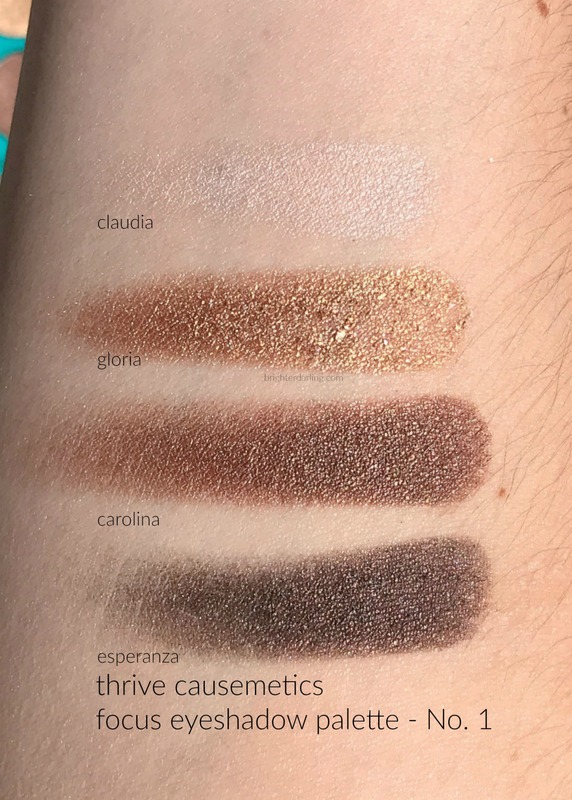 I also think the shades/swatches on the website are very misleading for this particular product. My biggest disappointment was the gloss. However, it’s a combo of my mistake (ordering a light color) and the website not being accurate in color. I found it also did not last long whatsoever on the lips, but it was very comfortable and creamy. The eyeshadow is awesome. This particular palette gives me major Urban Decay Naked 1 vibes – it is like they took the best/most useable shades in Naked1 and put it in a quad. 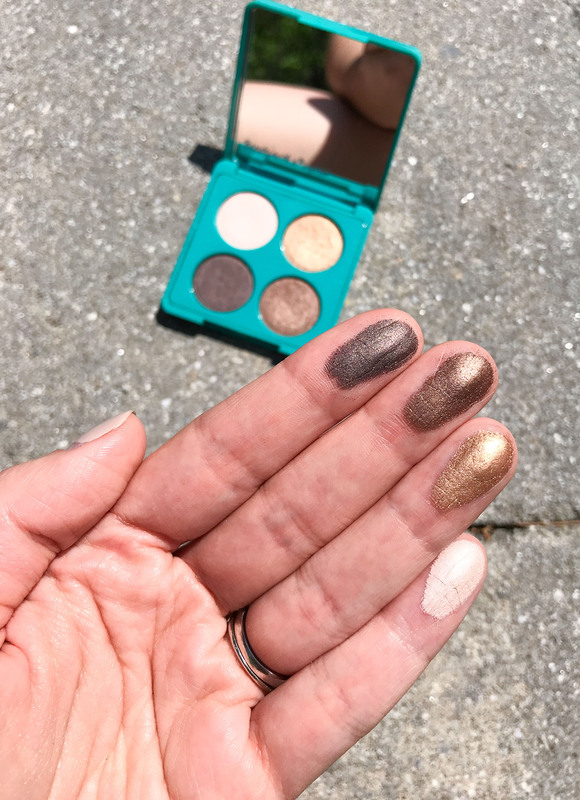 Super creamy, very blendable, very pigmented but buildable… I have zero complaints and think the quads would be a wonderful gift for those who want no-brainer eyeshadow that they can wear every day. The mascara is also amazing. Every time I’ve worn it, someone thinks I’m wearing false lashes. It lasts through the longest of days with no flaking or smudging and the packaging is super high quality. It’s a very weighty, metal tube and the richness of the black is excellent. 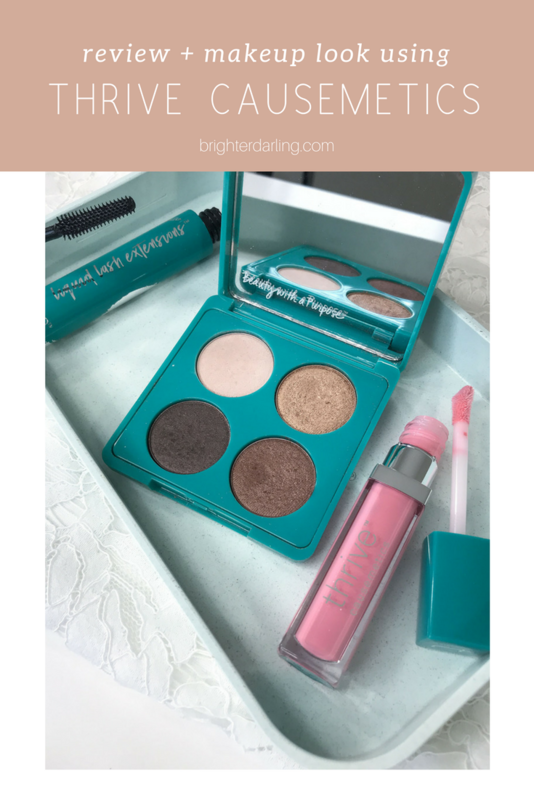 After trying these few items and teasing a bit on my IG stories, several followers reached out and told me that their bronzer, highlighter, and liquid eyeliner are equally incredible. Definitely interested in trying more from Thrive (maybe next time I’ll order a lipstick or liquid lipstick to be fair to their lip products)! Again, find Thrive Causemetics on thrivecausemetics.com. Have you tried Thrive before? What are your thoughts? Are these products that are up your alley? Let me know in the comments!